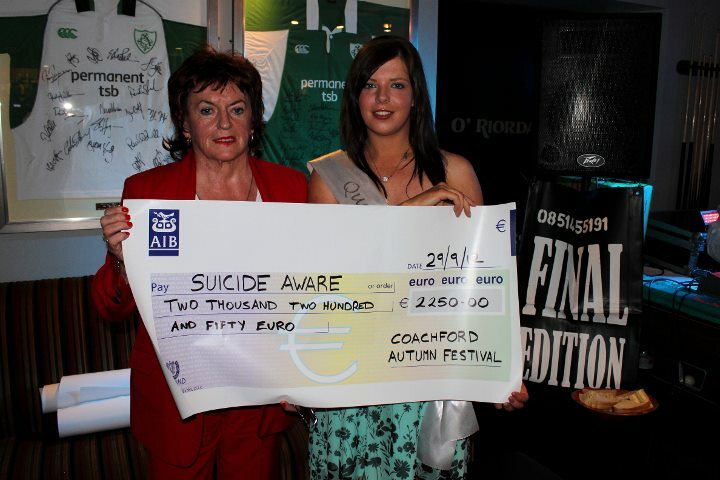 Pat Behan from Suicide Aware accepting a cheque from Coachford Autumn Festival Queen, Kellie Browne. Congratulations to Shannon Murphy and Emma Flanagan from Coachford who both won gold in the World Kick Boxing Championships in the USA last Friday. This was a huge achievement for the girls and for the Coachford club. Shannon won an amazing two gold medals at the competition in Florida last week. She picked up the first of her medals in the ‘Full Contact’ grade and the second in ‘Tul’. Emma won her gold in ‘Close Contact’ . Both girls also won silver medals in other grades. Emma’s Mother, Kathleen Flanagan won a silver medal at the championships in the veterans -60kg sparring. Kathleen fought a great semi final but was unable to fight the final due to a rib injury. Well done to Coachford AFC A team who defeated Buttevant A in the Munster Junior Cup 1st round by 3 goals to one last Friday night. The A team have been draws against Glen Celtic in the next round. The B team lost to Los Zarcos by a goal to nil on Saturday afternoon in the league. Next Saturday both teams are involved in the 2nd round of the AOH Cup. Coachford A play Knockavilla in the Glebe at 3.00pm while the B team take on Springfield in Carrigadrohid at the same time. Killanardrish/Coachford take on Bandon in the Under 12 league on Saturday at 1.15pm.